the games weren't just a moment of leisure, but were also an occasion in which people, institutions and the powers congregated. Valerius Maximus tells that Senators and the common people, at least up to the year 560 b.C., assisted to the shows together, standing. Later on the division deepened, and the amphitheatre reflected this new order. 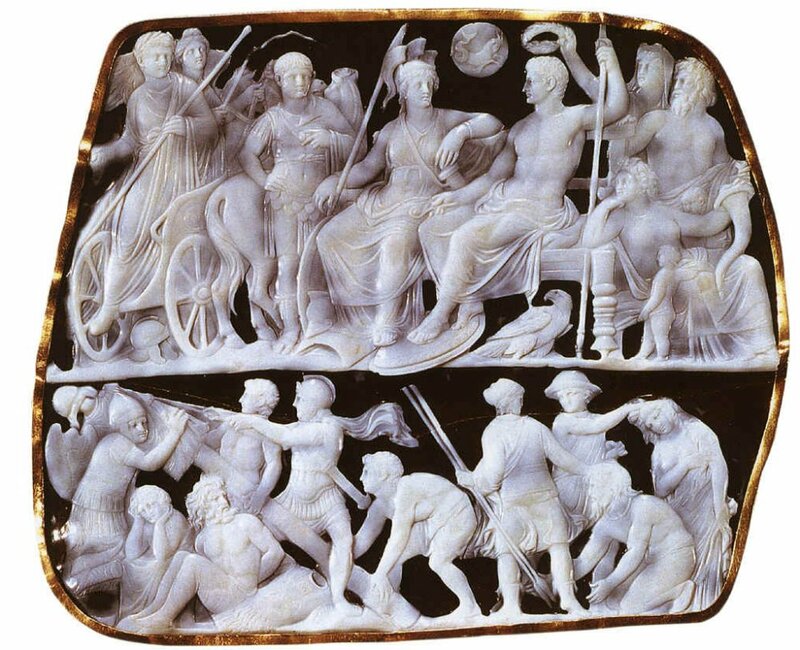 Roman society was tightly divided into classes, and this separation was observed also on occasion of the games. However, in the arena-mania that developed in Rome, the amphitheatre became the place were the common folks could meet the upper class - even the emperor - and sometimes could address him directly. The story of the emperors' relations with the arena is long and interesting, and it will appear on this site as soon as possible. The games were strictly reserved to the citizens (slaves weren't admitted), but tickets were not on sale; instead, institutions, brotherhoods, sisterhoods, companies, corporations, associations, fellowships, leagues, unions et cetera had their places assigned in the amphitheatre, as a consequence of the role and the rank they had in the society. The ones who did not fit the above description tried to find a protector that could grant them the privilege of a seat by invitation. This custom lasted for a long time: only after the 4th century AD some seats started to be inscribed with the names of families, or of single senators. In amphitheatres, circuses and theatres each rank was assigned a certain seating, which was considered a prized privilege. We know that in 490 BC Manius Valerius Maximus got the right, valid also for all his descendants, to place his seat in a particular place of the Circus Maximus. Scipio the African proposed in 194 BC that the senators, as such, had seats separated from those of the commoners. Around 90 BC Sulla allowed the women in the theatres. 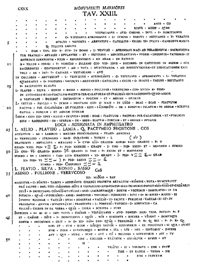 In 87 BC the Lex Roscia Theatralis assigned to the knights the first 14 rows of seats (XIV Gradus proximi) in theatres. People were outraged by that, and strongly opposed this measure, so much that some think that this law was not enforced in amphitheatres. The spectators had to dress up: the citizens who were entitled to it had to wear the toga, the robe Romans wore on the great occasions (Martial, IV, 2). Citizens who did not enjoy good reputation - bankrupts and profligate - were destined to sit with the plebs at the top, but in ancient times even unaccompanied women were allowed. Alcohol was forbidden: people were not supposed to drink alcohol during the games, and the writer Lampridius criticized the emperor Commodus because he used to drink in the amphitheatre. For more info on the practical organisation see this page. On the day of the games people came very early, and sometimes even slept out of the amphitheatre. To enter, the spectators had to produce to the designatores, the ushers, a tessera, an invitation. The tessera - like today's tickets - reported the exact location of the seat: cuneus, gradus and locus (sector, row and seat). For example, CVN III GRAD IV LOC I corresponds to sector 3, row 4, seat 1. It seems, however, that if one spectator left his seat during the day he lost his right to it (Quintilianus, l.VI, c. III). Each locus was identified by lines cut in the seats. People sat on wooden planks placed on the marble stones, but the elite could be more comfortable: the senators had cushions at first, then they were allowed chairs called curules, and cushions were accorded to the equites. 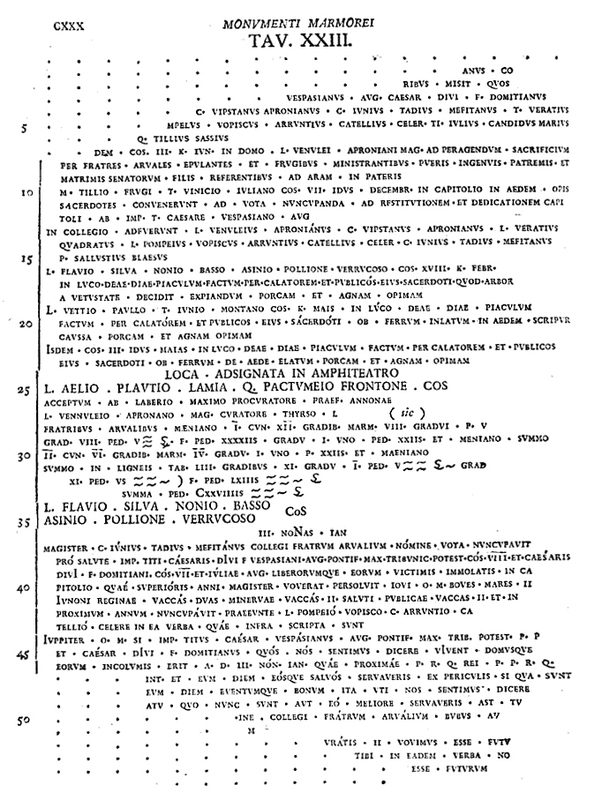 We have a list of many institutions that had places assigned in the cavea: the tribuni and their viatores(summoners), the religious collegia (that were 8: Pontifices, Viri Epulones, Augures, Fetiales, Arvales, XV Viri Sacris Faciundis, Sodales Titii and Salii), the semi-official collegia (Lupercorum, Mercurialum, Capitolinorum, Veneris Genetricis, Minervae), the sodalitates (kind of private religious associations: Sodales Matris Magnae, Augustales, Claudiates), the patres familias and the praetextati(the toga praetexta was the garment, bordered with purple, worn at Rome by the higher magistrates and by free-born children till they assumed the toga virilis). There was place also for the kids from the nobiliores et honestiores familiae (distinguished and honorable families), and their teachers. The poor - and the women after Augustus - had to go up to the top, in the porticus, and they participated to the games under the banner of their tribes (yes: Roman citizens first and then the citizens from the surrounding regions were organised in tribes, that were basically the voting constituencies), furtherly divided by their civil state (married/unmarried). At some point between 20 and 17 BC, Augustus introduced the Lex Iulia Theatralis, which brought order in this matter by regulating minutely the seating arrangement of all the classes in public places like theatres, amphitheatres and circuses. Of course the senators had the seats nearest to the action, then came the knights, military men, married men, boys and their teachers, non-citizens and the plebs. He also banned women from public spectacles, and these rules were enforced all over the Empire. 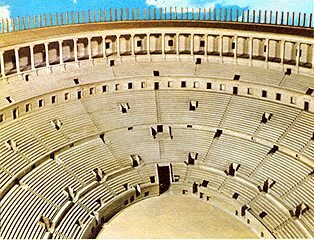 As Jonathan Edmonson wrote, "the full complexity of the social distinctions laid down in the Lex Iulia Theatralis became permanently enshrined in the seating plan of the Colosseum. Like all amphitheatres, it was planned to keep the different classes of spectators separated. They had different entrances and seats in the cavea. The entrance on the north side seems to have been connected with the Esquiline by a porticus. A wide passage led directly from this entrance to the imperial box (pulvinar) on the podium. A corresponding box on the opposite side of the podium was probably reserved for the Praefectus Urbi. The entrances at the ends of the major axis led directly into the arena. 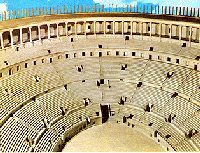 For more info on the seating, see the whole Edmonson essay on PUBLIC SPECTACLES AND ROMAN SOCIAL RELATIONS. the podium, with wide and low steps where the privileged could place their personal chairs. It was reserved to senators, to most important priests, the clarissimi from senatorial families, viri consulares, magistrati etc. the maenianum summum in ligneis, also called porticus (it's the top portico with wooden seats, not indicated in the picture on the right). As an example of the division of places, we have a very important document: the minutes of the proceedings of the Fratres Arvales, which was an ancient college or priesthood of 12 members elected from the highest ranks, whose main original duty was to offer annual public sacrifice for the fertility of the fields. 96 of their Acta (minutes) of their proceedings, inscribed on stone, were discovered in the grove of the Dea Dia Temple near Rome. 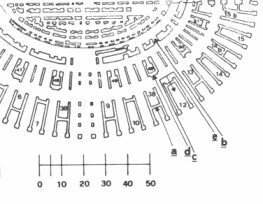 In the proceedings of 80AD there is a description of the spaces reserved to the Arvales in the different sectors of the Colosseum (in fact reserved to their friends, clientes and servants, since the 12 Arvales were probably sitting in the senatorial sector). Many scholars during the centuries have tried to interpreted this writing, as it is difficult to explain the meaning of the digits, leaving alone the correspondence with a number of seats. According to modern interpretations of the stone, the Arvales had in total about 130 ft, corresponding to 37 metres. Considering 40-50 cm for each person, the Arvales could accommodate 70-80 people. Places were highly sought after, and we can imagine that the popularity of the Emperor Trajan reached a peak when - not long before the year 100 - he demolished the imperial tribune and donated 500 seats to the people, as an inscription reports. Many fragments of the marble seats bear the indication of the class to which they were destined. Most of the fragments date back to the III or IV century, and some bear the names of Roman families and senators who were already known to the experts from different sources. Some fragments bear only the name of the family, and it seems that related families (we would call them clans) sat nearby, showing the unity of the group in front of the community. When seats were assigned to a different person or family the inscription was erased and the new name engraved in the stone. A recent research on the fragments shows that one of the seats could have belonged to Iobius Philippus Ymelcho Valerius, perhaps the same Valerius who was consul in 521, and this should prove that the amphitheatre was still in use in the VI century. 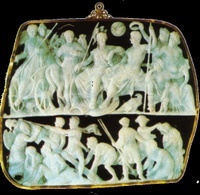 In the city of Rome, for the practical organisation of the games, the emperors set up in the first century an organisation for the production of the games. There was the Ratio a muneribus, a kind of Ministry of Games with organisational and financial powers over the venationes and the munera. The costumes and the pegmata, the machines that appeared on the arena from underground and instantly unfolded producing a scenery, were built, from the times of Vespasian to Hadrian, in the Summum Choragium on the Summa Sacra Via. When that place was destined to the grandiose temple of Venus and Roma, the Summum Choragium was transferred nearby, in the region of the city called after the temple of Isis and Serapis (now around Via Labicana). A knight of the equestrian order was at the head of the Ludus Magnus, the main gladiatorial school of Rome. 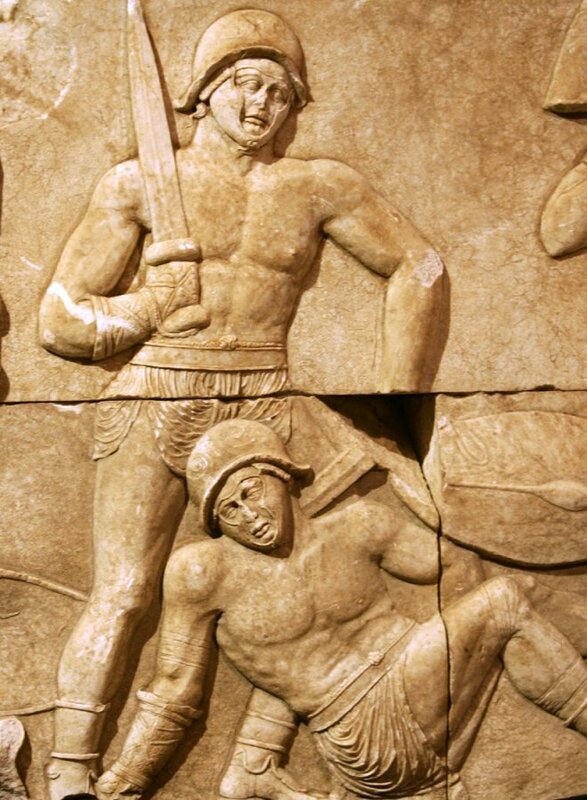 The other schools in Italy and over the empire were directed by officers called procuratores familiarum gladiatoriarum. 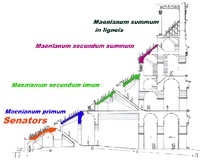 The system of entrances and stairs of the Colosseum has also been studied. The image on the right shows one quadrant of the amphitheatre with the 5 paths a, b, c, d and e, which are repeated symmetrically all around the building. The 12 "b type" paths led straight to the lower senators' seats, and 16 "d" paths led to the upper senators' seats. 20 "a" paths led to the maenianum primum and to the upper ones.16 "c" and 16 "e" paths led to the same corridor of the "a" path. 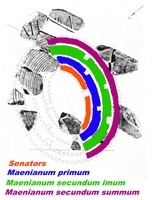 However, in the Colosseum a strict separation between the different classes doesn't seem to have been possible, and the only real division seems to have merely been between the senators and all the rest.